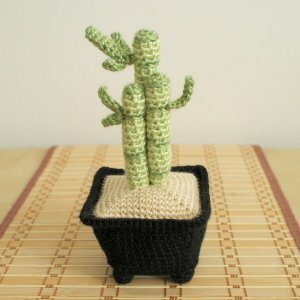 A crocheted Lucky Bamboo arrangement never needs watering, never dies, and is always fresh and green. It's the perfect thing to brighten up your office desk, or to give as an unusual and thoughtful gift. Add a little Zen tranquillity to your life with a Lucky Bamboo! Lucky Bamboo is an original crochet pattern by June Gilbank. Pattern includes full instructions with step by step photos at every stage, so you can easily crochet your own lifesize Lucky Bamboo.With three stalk sizes and three different leaf patterns, you can create your own bamboo arrangements with as many stalks as you want. The Chinese-style pot features my special new technique that allows you to crochet in the round and still create real square corners - the shaping is built right into the crochet! Yarn: worsted weight yarn in 2 shades of green (alternate colour scheme for if you only have one shade of green is also included), beige/sand, and any colour you like for the pot. Date Added: 07/08/2018 by Donna P.
Date Added: 03/01/2012 by Monica B. Date Added: 05/03/2010 by Rebecca B.